Early October 2016, Hurricane Matthew devastated the majority of schools in the Southern department and Grand Anse in Haiti with winds as strong as 146 hours per hour. UNICEF estimated that 75% of schools were damaged or destroyed. Faced with the urgency of the situation, and with funding from the Fondation de France, Haiti Futur has set up a rapid rehabilitation project for 40 schools in the departments of the South and Grande Anse, in coordination with the Ministry of Education. National Education and Vocational Training (MENFP) supported by UNICEF. Concerned about the sustainability of the rehabilitated works, Haiti Futur has imposed itself to follow the norms of hurricane proof construction, while complying with the standards published by the School Engineering of the MENFP and by the Haitian National Building Code (CNBH). For this, Haiti Futur has trained its teams through a partnership with the Diocesan Center of Arts and Crafts Caves (CDAM), known for its expertise in the field. 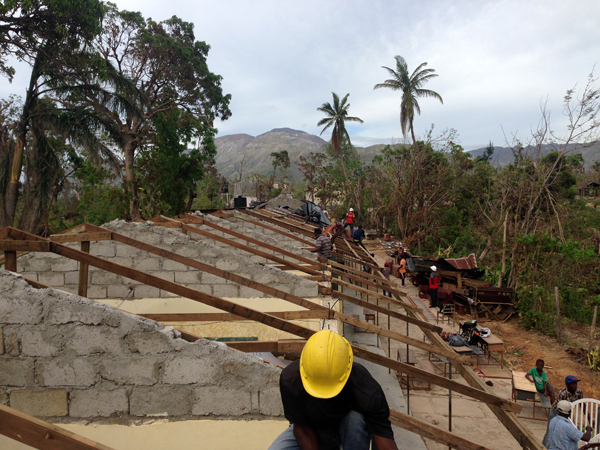 To contribute to the support of local economic activity, Haiti Futur has recruited several teams, entirely local, from both departments and is sourcing building materials from a supplier in Les Cayes. In order to capitalize on this experience, Haiti Futur has produced a documentary Siklòn pap kanpe lekòl and a series of video vignettes to raise awareness of hurricane proof construction standards, aimed at professional schools and the general public. In the video below, Haiti Futur explains why we as an organization decided to rehabilitate 40 schools and describes the proper hurricane defensive building techniques that were implemented. Matthew and SmartBoard : surprising news.